The designer feel of this gorgeous floral gift makes it a fashionable statement for summer events, whether it’s to celebrate a new baby, deliver congratulations for a promotion, or say "Happy Birthday" or "Happy Mother’s Day." 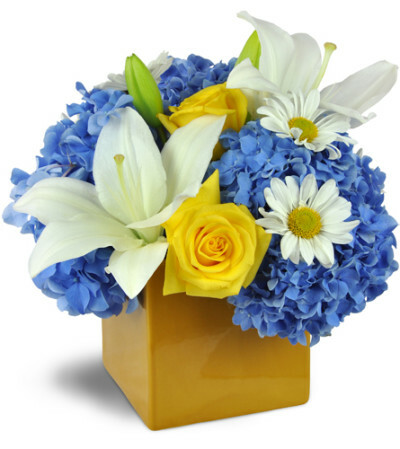 Beautiful bright blue hydrangeas blend impressively with white lilies, yellow roses, and daisies, all peeking sweetly from a happy yellow ceramic cube vase. Bright blue hydrangeas, yellow rose blooms, white lilies and daisies are arranged gorgeously in our sweet yellow ceramic cube vase. Easy navigation through the order process, delivered same day as promised, and the flowers were beautiful. Ordered them at 11:30 cause my girl was having a bad day, they were delivered to her work by 3:30 and she loved them. Beautiful flowers and great delivery time. The flowers were beautiful (she sent a picture)! So pleased that she loved them and they were delivered as promised. The bonus was no delivery fee! Will definitely use Magical Flowers for You in the future. 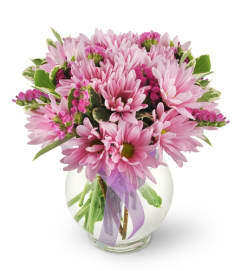 Magical Flowers for You is a Lovingly Florist in Naples. Buying local matters. Discover how Lovingly supports local florists. Copyrighted images herein are used with permission by Magical Flowers for You.